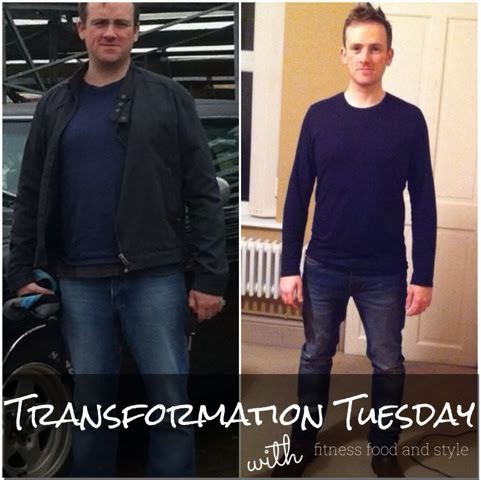 Another amazing Transformation Tuesday story from Colin as he shares his new healthy lifestyle with us and ditches the beer and pizza nights. Keep up the great work and I look forward to following your progress. Give Colin a big virtual hand of applause!!! My name is Colin and I am 34. I was always pretty fit when I was younger, I used to cycle absolutely everywhere! However, when I got to University, lets just say I enjoyed beer a little bit too much. That coupled with the fact that I didn’t make time to eat well or exercise meant I put weight quite a bit of weight on. When I left Uni, I took up running and got really into it, running races for a club. My weight dropped to below 10 stone at about 25 years old which was probably a bit too light. However, due to injury and a lot of job changes, I stopped running and that’s when the weight started to come back on. For the last few years, I've put a lot of focus into my career at the expense of eating well and exercising and due to a stressful job, it became routine really to have a couple of beers each evening. The thing about alcohol is that when you have it on an empty stomach (even if its only a little bit), you crave bad foods and don't want to cook and that's what my problem was. So for the last few years its been no exercise, regular consumption of beer and a very bad diet. What types of foods did you used to eat as a kid and young adult? What's changed since then? As a kid, my mum made me eat good foods, but that’s not to say I enjoyed them! So good hearty meals, root veg, turnip, cauliflower etc. However, as a teenager and younger adult, food became just a tool to stop hunger. I was very pre-occupied with my studies or work meaning I ate when I was hungry and wanted something quick and easy. As mentioned earlier, this often coincided with a couple of evening drinks when I got in from work so my diet choice was really poor. At best, I would eat a microwave ready meal and at worse, it was stuffed crust pizza from the local takeaway. Basically I ate a lot of cheese and pasta and not a lot else. Although I had been promising myself for a couple of years that I needed to sort my diet and fitness out, it never really seemed to be a big problem, maybe I was in denial. What changed however was one work day morning after a session in the pub that concluded again with takeaway pizza. I felt absolutely disgusting. I was passing awful wind, I was tired, lethargic and groggy and after washing my hands in the gents, caught a view of myself in the mirror and I was disgusted with myself. In profile, I could see my guy overhanging my jeans and was appalled. I looked terrible, I felt terrible. It was there and then that I thought "I don't want to look this way or feel this way anymore". I decided that until further notice I would give up alcohol. The next day, I felt so much more alert and fresh and my diet choice immediately improved. Out went the processed stuff and in came fresh salads, fish and chicken. Physically, this change in diet in addition to giving up alcohol made me feel even better and made the decision to abstain even easier. My weight started coming down really quickly and before I knew it, I was almost two stone lighter and fitting into a 32 inch pair of jeans again for the first time in 5 years. My confidence has improved and my appetite for life and trying new things (particularly active and outdoor stuff) has grown tremendously. I just love it. Now I am planning on toning up by following the Freeletics Strength Programme - I am currently in week two. I don't play any team sports although I'd like to find something for the social benefits it brings. I still do a lot of running (did a half marathon in Sept 2013 and another in Oct 2013) and do a lot of boot camp classes at the Gym in addition to the Freeletics I mentioned earlier. I also snowboard as and when I get the opportunity. I love watching Football, tennis and athletics which is a particular favourite. I've been playing the drums for 4 years now but yet to find a band as much as I would like to! Trying new things definately makes me smile now that I feel so much more energetic. There is so much out there to enjoy in life and I for one have been very guilty for not making the most of the opportunities life brings. I shall be making up for that in 2014! The day after 3 pints of beer followed by takeaway pizza. I looked terrible, felt terrible. I was disgusted with myself. I'd like to complete the 15 week freeletic programme and see a good improvement in the toning and definition of my body. I've never been toned, let alone 'ripped' and would love to have a nice flat tummy so thats very much the immediate thing I would like to achieve. After that, I want to learn some new things, maybe a martial art and also get out into the great outdoors a lot more.